ISLAND IMAGES » Capt. 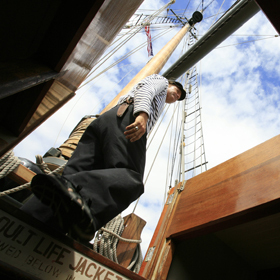 Kellick emerged from the forward saloon yesterday aboard the vessel Lynx, a 122-foot topsail schooner at Ko Olina Marina. Jonathan Stockton, 33, might have contracted botulism from a recalled canned food product. The Army charges that Corrales shot the Iraqi civilian several times and then ordered Shore to do the same. The trio used bleach and a computer printer to turn $1 bills into counterfeit $100, $50 and $20 notes, the U.S. Secret Service alleges. Hawaii taxpayers could shell out more than $100,000. A Hawaii event that benefits ill children moves Japanese artist Maki Ohguro to song. Several participants finish UH clinic with scholarship offers. Mesa and a consultant fail in their bid to stop a lawsuit by Hawaiian. The Hawaii Supreme Court ruled that a law allowing diversion of employer contributions to the state pension fund was unconstitutional.